There are many wonderful benefits to living with the person you love, but sharing a bathroom isn’t necessarily one of them. No matter how much you enjoy your significant other, it can be a real challenge to share bathroom space, not to mention the responsibility of keeping it clean. The sooner you consider these facts of life, the better for your relationship. Communicate — Communication is the key to making bathroom-sharing better for both of you. Put any two people together and you can expect two different viewpoints. Maybe you’ve always used all three vanity drawers and now your partner needs a place for toiletries. Perhaps you’re fine with letting the bathroom grime accumulate for weeks, but your significant other is disgusted by daily dirt and grunge. Whatever the case, you need to talk about it. Schedule an open discussion about your individual expectations and preferences as soon as possible after moving in together. Organize storage space — When you have a finite amount of space to share, you need to make the most of it. You might divvy up drawers or cabinets on a one-to-one basis or create a workable scheme for what goes where in the bathroom closet. Either way, come up with a mutually acceptable plan that provides adequate space to both of you. Create a cleaning schedule — One of the most dreaded parts of sharing a bathroom is dealing with cleaning — who does what and when? Couples handle this different ways, so talk to your partner about what works for both of you. Whether you split up daily chores or take turns scouring the bathroom each week, address the cleaning issue before it becomes a serious problem. For some couples, hiring a professional cleaning service could be the best solution to this bathroom conflict. Schedule appropriately — There’s nothing as frustrating for a couple on a schedule as needing to use the sink or shower at the same time. So skip this problem by planning ahead. If you take twice as much time to get ready as your significant other, discipline yourself to get up earlier and grab the first shower. Even if your morning routine is fast and furious, you still may want to tackle it first in order to get quickly out of the way of your more leisurely partner. Figure out what schedule works best for both of you. Implement a few habits together — Nobody wants to be the only one regularly wiping down the shower or sink. If one of you always leaves hair on the vanity, that can be a real annoyance for the partner who keeps finding it. This is a great example of how implementing a habit together can be a game changer. Stash sanitizing wipes under the sink and agree to clean up stray hairs or grime whenever they happen. Other great habits to cultivate include suctioning a shower squeegee to the shower wall for daily wiping and hanging the toilet paper in a mutually agreed-upon direction. The keys to successfully sharing a bathroom and to building a successful relationship are the same: communicate, think about each other and be fair. By learning how to share a bathroom with your partner, you only improve and deepen your connection. How much time do you spend in your bathroom? A few minutes a day? An hour or more? Chances are it’s more time than you realize. Whether you’re in and out of your bathroom in minutes — or take a more leisurely approach to your morning routine — the time you spend there can made a big difference in whether your bathroom is environmentally friendly. Start with the taps — Do you already shut off the water at the sink while you soap up your hands or brush your teeth? Good work! Take it a step further by choosing water-efficient bathroom faucets. They reduce flow, allowing you to use less water for everyday tasks like washing your hands. Take shorter showers — A hot shower is relaxing but spending too much time in there can quickly add up in terms of water usage. Make your shower routine more efficient or set a timer to make sure you’re not wasting time, money and water in the process. A high-efficiency showerhead will ensure you use less water while showering, no matter how much time you spend under the spray. Clean up the way you clean — You don’t have to sacrifice environmental concerns for a room that sparkles and shines. Instead of opting for cleaning products that contain bleach, ammonia or other harsh chemicals, consider natural alternatives. For example, to clean your toilet, dump a half-cup of baking soda into the bowl and add a quarter-cup of vinegar. Scrub it well after the bubbling stops. An equal mix of water and vinegar is an effective cleaner for getting rid of soap scum and everyday dirt. Create less garbage — Paper towels are expensive and end up in landfills after a single use. Instead, use a damp cloth or sponge to wipe down bathroom surfaces and mirrors. Each can be rinsed off, washed and reused, unlike paper towels or disposable cleaning cloths. Use towels more than once - Break yourself of the habit of tossing a just-used towel into the laundry. You’re using it to dry off a clean body, so hang it up and use it several times before washing. You’ll save water, energy and time as well. Consider low-flow toilets — Did you know you probably use more water flushing your toilet than showering each week? A low-flow toilet can make a big difference in how much water you use with each flush. Go tankless — If it’s time to replace your water heater, consider the tankless option. While this is a bigger-ticket item, a tankless water heater uses less water than traditional models. Modern Bathroom offers a variety of eco-friendly bathroom fixtures to help you make the transition to a greener space. We’re here to help you do your part to save the planet and save money — while you enjoy a beautiful, well-appointed bathroom. For some men, the worst part of maintaining facial hair — or, on the flip side, maintaining a lack of facial hair — is dealing with the mess. Whether you shave every morning or trim your beard once in a while, you can easily end up with hair all over your bathroom sink. To keep hair from potentially clogging the drain, here’s a guide for how to keep your sink clear and clean during shaving. Use a bowl. Rather than rinsing your razor in pooled sink water, use a bowl of water instead. The bowl allows you to keep shaving cream scum and whiskers separate until you’re ready to discard under running water — rather than running the risk of clogging the drain after pulling the stopper. Run hot water after each shave. Running hot water daily can help prevent hair-related clogs. Hot water helps to flush pipes and move debris through the plumbing system. Clear the drain with baking soda and vinegar. On a monthly or bimonthly basis (or anytime you notice a clog), clean your drain in the following manner: Pour a half cup of baking soda into the drain, followed by a cup of white vinegar. Wait 10 minutes. Then run hot water to flush the mixture in the drain. This natural solvent can help remove buildup inside pipes. When trimming, start with a dry sink. If you’re trimming rather than shaving, there are ways to contain the mess — so you can discard rather than flush hair down the drain. Try trimming over a paper towel or some sort of sink liner, or into a dry sink — so hair can be easily removed and thrown in the garbage. Any guy who has a beard or shaves regularly can relate to problems of hair in the sink. Use the tips above to help keep your drain clear and your vanity clean! By practicing preventative measures and responding quickly to any clogs that occur, you can minimize plumbing issues and keep water flowing freely — not to mention avoid a mess! There are many features women love about having long hair — but constant drain clogging isn’t one of them. Anyone with long locks knows the struggle of seeing water pool in the shower. Brush your hair before you shower. If you can get in the habit of combing or brushing your hair before showering each day, you’re doing yourself a big favor. This small step may allow you to remove a lot of the loose strands that would have otherwise clogged your drain. Doing so only takes a few minutes, costs nothing and can make a difference. Install a hair catcher. There are several hair catchers on the market today, able to be installed into a drain for collecting strands of hair. These products allow water to run through the drain freely but stop hair. This allows you to pull out the strainer and remove the hair to the trash, rather than letting it clog your pipes. Clear the drain with boiling water once a month. As another preventative measure to minimize drain clogs, try pouring boiling water down your drain monthly or bimonthly. The hot water helps loosen any hair or gunk that is caught in the pipes, before the problem becomes bigger. After pouring the boiling water, always follow up with warm water for about five minutes. Respond to any problems immediately. Should hair get down the drain from time to time, enough to cause blockages, don’t ignore it. As soon as you notice any sort of clog, take action. You can use a bent wire (or your hands) to try to loosen the blockage, for example. Catching it early makes the process much simpler. Other solutions include pouring 1 cup bleach into the drain at night and then running warm water down the drain for a few minutes in the morning. Or, try pouring ¾ cup baking soda and ½ cup vinegar down the drain. Then, pour boiling water 30 minutes later. When these homemade solutions don’t work, you may need to contact a plumber. When it comes to hair clogs in the shower drain, prevention is your best bet. Take steps to minimize how much hair is entering the drain, and you can keep clogs from occurring. For those blockages that do happen, however, always respond quickly. Minor blockages require simple solutions — much easier than bigger clogs. The warm, moist climate of your bathroom isn’t just great for getting ready each day — it’s also perfect for keeping certain plants. A great tool for adding vitality to your living spaces, household plants bring the beauty of the outdoors inside your home. Keeping some in your bathroom can make it more inviting, enjoyable and calming. Aloe vera: As a heat-loving succulent, aloe vera requires minimal upkeep and loves bright, indirect light. Set it away from the window in your bathroom, but somewhere that light can still hit it each day. As a bonus, the juice from this plant’s leaves are soothing and healing for minor scrapes and burns, making it a great addition to your at-home medicine cabinet. Begonia: Pretty begonia blooms not only can handle bathroom humidity; they prefer it. These plants do best indoors, in fluorescent lighting, somewhere that they can get daily humidity or regular misting. If you must keep one by a bathroom window, you can, as long as it’s not north-facing. Fern: Ferns such as the Boston fern, asparagus fern, staghorn fern or bird’s nest variety all do well in bathrooms. These plants prefer temperatures between 55 and 75 degrees Fahrenheit, and for their soil to be kept moist but not oversaturated. Cast iron plant: Named for its indestructibility, the cast iron plant is as durable as your favorite kitchen pans. This variety does best in low-light or indirect-light environments and is beloved for being so hard to kill. Orchid: The elegance of an orchid makes it a great addition to a luxurious bathroom, whether set on a windowsill or on the sink corner. This plant thrives most in high humidity and indirect sunlight. Peace lily: All it takes is limited light, humidity and regular watering to keep peace lilies happy in the bathroom. Don’t let the soil get too dry and move the plant to a brighter location if it’s not flowering. Otherwise, simply enjoy the natural beauty this plant offers. Philodendron: Another tropical plant that requires little care is the philodendron, a hardy variety that likes bright and indirect light, average humidity levels, and temperatures between 75 and 85 degrees Fahrenheit. If the leaves ever start drooping, check the soil — either you watered too much or not enough. 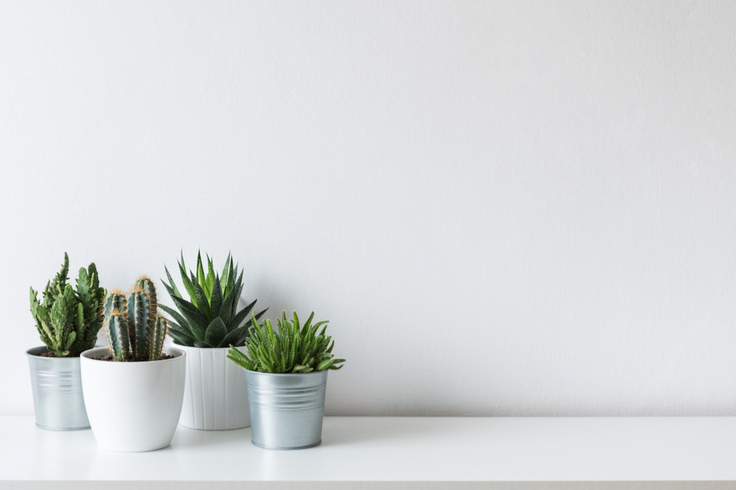 When you’re looking for low-maintenance plants great for this part of your living space, any of these options are a perfect choice!